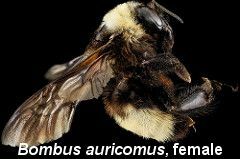 There are 46 species of bumblebee in north America. The body lengths are in millimetres and do not include the antennae. 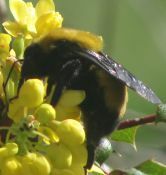 The tongue lengths are given when known as this will help in ID as a short tongued bee cannot reach the nectar of a long corolla flower unless it is nectar robbing, and a long tongued bee can forage from any flower, but will usually show a preference for complicated or long corolla flowers. For more on this see the tongue page. And the behaviour page. Range: New Jersey down to Florida, North and South Dakota, Nebraska, Colorado and New Mexico. 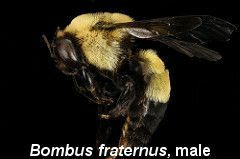 Found in grasslands and gardens where its favourite flowers include, St. John's wort, bee balm, sumac, asters, sunflowers, goldenrods, and thistles. Nests underground. 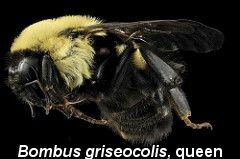 Sadly this bumblebee is now listed as endangered. Body length in mm, queen 25 - 27, worker 15 - 19, male 22 - 25. Queens and workers seen from April, males from August. Short tongue. Hair short and velvety. Range: California and Mexico, it is and uncommon species and is usually found in open grassland and scrub. Its favourite flowers include, Antirrhinum, Phacelia, Clarkia, tree poppy, and California poppy. This species has a short - medium tongue. its hair is short and even, and it nests underground. Body lengths in millimetres, queen 22 - 25, worker 12 - 20, male 14 - 19. Queens are seen from March, workers and males from mid April. 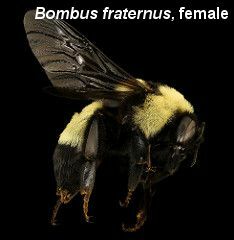 Note: sometimes just called Bombus auricomus. Range: Ontario to Florida, west to Texas, Oklahoma, West Virginia, Colorado, Wyoming, Montana, Saskatchewan, Alberta, British Columbia. Found in open forests and fields. Uncommon in the east. Favourite flowers include, asters, ornamental currants, bee balm, nightshades, St. John's wort, Eupatorium. Long tongued species, hair is short and even. Body lengths in mm, queen 22 - 26, worker 16 - 19, male 13 - 21. Queens seen from May, workers from July and males from August. Nests are small and on the surface or underground. Range: Alaska to California, Arizona, New Mexico east to Wisconsin, Mexico. Found from sea level up to 2200 metres. Favourite flowers include, balsam roots, ceanothus, dandelions, Gypsophila, lupins, thistles, sunflowers and currants. Long tongued species, hair is short and even. Body lengths in mm, queen 24 - 25, worker 15 - 21, male 16 - 19. 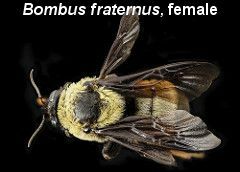 Queens are seen from April, workers from May and males from June. Nests are underground and sometimes on the surface. Males will chase anything that moves when searching for mates. Range: British Columbia to California, east to South Dakota, Nebraska, Colorado, New Mexico. It is a common species. Found on open, dry scrub. Favourite flowers include thistles, Asters, dandelions, salvias, sunflowers, lupins, sweet clover and rabbit bush. Short-tongued, hair short and even. Body length in mm queen 22 -26, worker 12 - 22, male 15 - 20. Nests underground. Queens are seen from mid March, workers from mid April and males from June. pensylvanicus Range: Quebec, Ontario, Maryland south to Florida, west to Minnesota, S. Dakota, Nebraska, Colorado, New Mexico, Mexico. 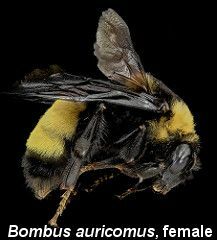 This is an uncommon species. Favourite flowers include sunflowers, centaurea, thistles, dandelions, vetches, clovers, goldenrod, St. John's wort, Eupatorium. Found in open farmland and fields. Nests on the surface, but occasionally underground. Can be aggressive. Males gather around the nest entrance waiting for the new queens to emerge for mating. Long-tongued, hair is short and even.. Body lengths in mm, queen 22- 26, worker 13 - 19, male 15 - 21. Queens seen from May, workers from June and males from July. In the west the males and workers are usually seen a month later than these dates which are for the eastern population. 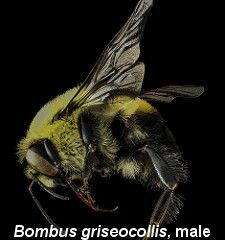 Parasitised by Bombus variabilis. Range: Quebec, Kentucky, Maryland, Pennsylvania, South Carolina, Virginia, West Virginia, south to Florida, west to British Columbia, Washington, Oregon, northern California. 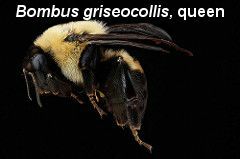 Found in open farmland, parks, gardens, wetlands. A common species. Favourite flowers include, milkweeds, thistles, sunflowers, goldenrod, asters and sumac. In the east Queens are seen from May, workers from June and males from July. In the west queens are seen from mid March, workers from mid April and males from July. Body length in millimetres, queen 18 - 23, worker 10 16, male 12 - 18. Hair is short and even. Short - medium tongued. Nests underground or on the surface.